Since Russell Davies bred new life into the long-running Doctor Who with Christopher Eccleston in 2005, each Doctor shone best when accompanied by strong companions. Whether through Rose’s constant belief in her man, Donna’s intelligence and dominance, and even Martha’s tenacity, the Doctor was better because of those who traveled with him. 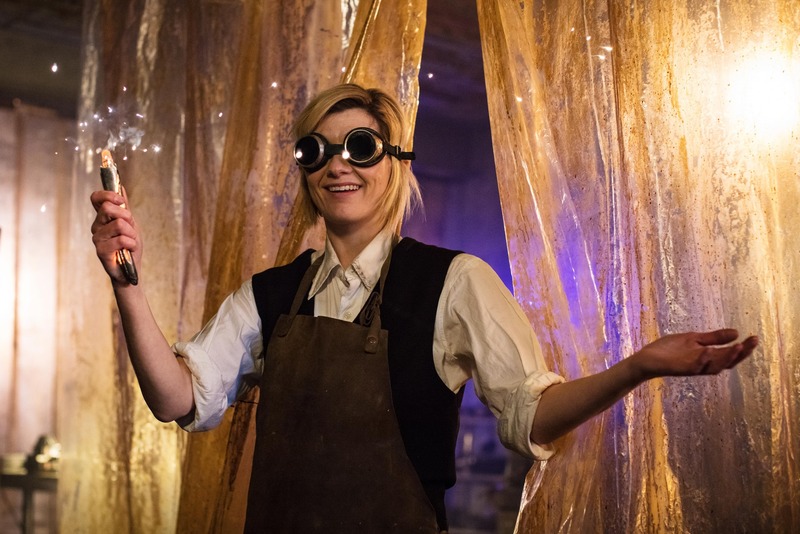 It appears new showrunner Chris Chibnall is taking that idea and amplifying it like a Stenza tentacle ball by spending the bulk of “The Woman Who Fell to Earth” on a quartet of featureless Sheffield locals, with little time for Jodie Whittaker’s triumphant Doctor to stand in the light by herself. The result is a somewhat lumpy and unbalanced premiere, ultimately saved by Whittaker’s dynamic enthusiasm. We begin with Ryan Sinclair (Tosin Cole) vlogging like it’s 2014 about “the greatest woman [he] ever met,” which right away we know is not the Doctor, but we’re along for the ride nonetheless. Ryan has never learned to ride a bike due to a coordination condition / his mother dying / his father leaving – it’s not all that clear – so his gran Grace (the tremendous Sharon D. Clarke) and her husband of three years Graham (Bradley Walsh) take him to the local rolling hills to give gravity a chance to aid him in his endeavor. The result leaves Ryan hunting for his bike in the trees and his gran taking the train home in defeat. While on his search, Ryan does what any curious person worthy of a ticket on the TARDIS would do: He touches a floating polygon that just so happens to give permission to Stenza warrior “Tim Shaw” — actual name –to hunt a human on earth. In place of the floating square appears a Dragon Warrior slime-shaped pod. Ryan calls “Police, maybe?” and is sent rookie Yasmin (Mandip Gill), who happens to be an old school chum of his. (What are the odds?) After overcoming her belief that the purple pod was some kind of prank perpetrated by Ryan, Yaz accompanies him out of the woods, as it is getting dark. Meanwhile, the train carrying Grace and Graham home is attacked by a different alien force resembling a coil of live wires, and just when it looks as if the pair are electric toast, the Doctor in all her glory falls from the roof and distracts the coil. Ryan and Yaz show up just in time to get shot by DNA bombs along with all souls on the train -– it’s not that scary; just a bomb that melts your DNA and is, apparently, highly illegal. The Doctor convinces Yaz not to include her police bosses because: reasons, and all decide to hunt the purple pod and the electric force — all except train passenger Karl (Jonny Dixon), who just really wants to get to work. The purple pod ends up in the hands of Rahul, a young man who knows it holds the creature responsible for his sister’s death. But we have little time to connect to Poor Rahul’s sorrow, as he is dispatched by Tim Shaw posthaste. The Doctor and her companions find not Shaw but Rahul’s body (missing one tooth) and all want answers. The Doctor, still regenerating, cannot remember her name nor where she left her TARDIS, but she does use the rather convenient parts in Rahul’s garage to manufacture a new sonic…Swiss army knife (I can’t even) and employs it to locate Tim Shaw. Grace finds all of this enthralling, Graham is scared shirtless, and Ryan and Yaz are there, too. When the company finds Tim Shaw, the monster removes his mask to reveal all the teeth he collects from his victims and wears on his person — on his face, more specifically. He’s on a hunting expedition to prove his worthiness or some such nonsense. All he has to do is find and kill one randomly selected human: poor Karl the worker bee. Tim Shaw decides to take the chance and detonate – but, of course, the Doctor has already removed the bombs and placed them the live coil thing, which Tim connected himself to in order to find Karl. The Doctor admonishes Tim for his choice, before Karl pushes him to his death –- much to the Doctor’s chagrin. Meanwhile, Grace attempts to destroy the live coil alien thing, resulting in her death (RIP). The gang attends her funeral (this episode is quite long) and suggest the Doctor change out of the Capaldi-suit she’s been sporting the whole episode. She chooses an outfit that a little Baker, a little the Legend of Billie Jean and builds a machine designed to get her back to her TARDIS. Yaz, Ryan, and Graham push buttons on the machine that are supposed to send the Doctor to the last planet where her TARDIS landed. It, of course, sends them all to space, unaccompanied. Fin. So: When comparing Whitaker’s introduction to the modern iterations of the Doctor, how does The Woman Who Fell to Earth stack up against the likes of Rose, The Christmas Invasion, the quite remarkable The Eleventh Hour, and Capaldi’s Deep Breath? I’m afraid, Dear Reader, the answer is a little more Capaldi than Smith — but altogether pretty okay. 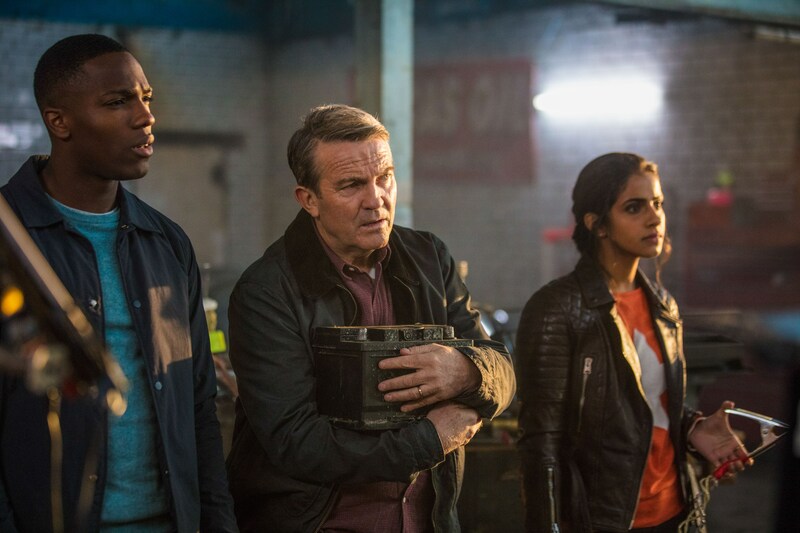 While Whittaker is captivating in the role (as expected), charming, empathetic, curious and enthralling, Chibnall’s script gives her little to do over the extended run time. The stakes, albeit high on paper, never feel all that dire. No one wants aliens to use humans like Junior and Eric use leopards, but this episode was never about saving the world. Just one crane operator who turns out to be a disappointment for Whittaker’s first save. I guess the message is that every life is valuable? Or something? The companions are given less-than-compelling backstories of varying depth, mostly through exposition, and though the tools are there to build a world about which we can care, I left the episode with a resounding “meh.” Given Chibnall’s sublime work on Broadchurch, where every character’s motivations are spelled on their faces without expository dialogue or overly dramatic scenes, I’m inclined to believe he felt the task overwhelming, having to both resurrect a beloved character in a new face and introduce a whole new pack of companions. The risk in making Who more of an ensemble show (as Chibnall discussed at Comic-Con) is that there’s simply not enough screen time to go around for who are already audience stand-ins. I will give the new showrunner the benefit of a few more episodes to develop the likes of Ryan, Yaz, and Graham, as there were breadcrumbs of Ryan’s determination, Yaz’s need to prove herself, and Graham’s fear. Time will tell. It’s not all bad news. In an interesting use of allegory, Chibnall utilizes Grace’s story – one of perseverance but ultimately defeat — to mirror the Doctor’s. Both are women (sort of) who have experienced loss, crave adventure and love deeply, and in this specific episode, either could be the titular woman who fell to earth. Yes, it was delivered via clumsy book-end with Ryan’s vlogging about “the greatest woman I ever met” but it was the subtle juxtaposition of their stories illustrates why someone like Ryan would follow the Doctor anywhere. Of course I’ll be tuned in next week to see if Chibnall build something compelling out of this foundation but mainly, I’ll show up for Whitaker. She’s just that good.